Engineering firms that work on construction projects now have an updated series of standard form contracts that reflect current business practices and come in a more user-friendly format. The Engineers Joint Contract Documents Committee, a joint venture of NSPE, the American Council of Engineering Companies, and the American Society of Civil Engineers, has updated the Construction Family (or C-Series) documents, which are coordinated with Engineering Family documents (E-Series). Available to NSPE members at a discount (www.nspe.org/ejcdc), the C-Series is made up of 25 documents. It is intended for use on engineered construction projects in which the owner retains an engineering firm to prepare drawings and specifications, then separately engages a construction contractor to perform the work. The C-Series assumes the design engineer is involved during construction. Administrative forms, such as change order and a certificate of substantial completion. Document C-700, Standard General Conditions of the Construction Contract, is the keystone of C-Series. The document includes provisions for payment alternatives such as lump sum and cost-plus and considers risk allocation consistent with industry norms. 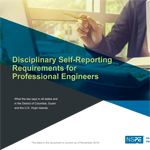 The document packet, C-700, costs $132 for NSPE members and $264 for nonmembers. Similarly, all C-Series documents are approximately half off the original price for members. Since the 2007 release of the Construction Series, the EJCDC Construction Documents Subcommittee has collected input and feedback about the documents and industry issues in preparation to update the documents in a five-year cycle. All contract documents are available for purchase online at www.nspe.org/ejcdc.